From the moment an act of violence takes place, CTVP’s teams are there, forging an immediate bond with the victims and their families, bringing them financial, practical, emotional, and spiritual support as they struggle to reclaim and rebuild their lives. We stay with all these families for as long as they need us – whether weeks, months or years. There is no end point to our help except the family’s ability to re-enter their lives successfully. Only then do we move quietly into the background, but still remain available for those times when the horror inevitably reasserts itself and help is needed once again. This is what makes CTVP so unique, we are there for the long-term. Since September 2015, terrorists have murdered 42 Israelis and wounded 573. 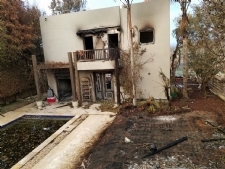 Now the terrorists are using arson to try to burn us out of Israel. These devastating wildfires have raged throughout the country. 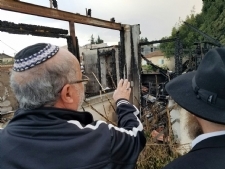 The homes of thousands of Jews have been burned. They have nowhere to go. Many have lost everything. Our help is urgently needed right now. 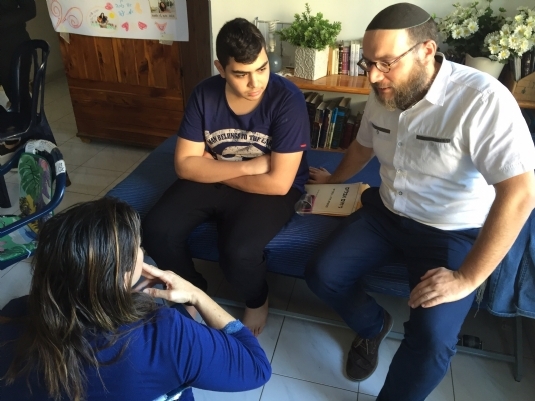 With over 300 Chabad Houses all across Israel, Chabad’s Terror Victims Project (CTVP), is bringing help to every corner of the country. We are wherever the victims of the fires are - wherever there are homeless families. Please help us bring food, shelter, clothes, comfort and more to those who have been left bereft, to those whose lives have been shattered. Please make an emergency donation to CTVP today. Together we will ensure that all Jews in Israel have the help they need now. Thank you. Yesterday I visited Otniel, the home of the Mark family whose lives were irreparably shattered by a vicious terror attack on Route 60 last week. 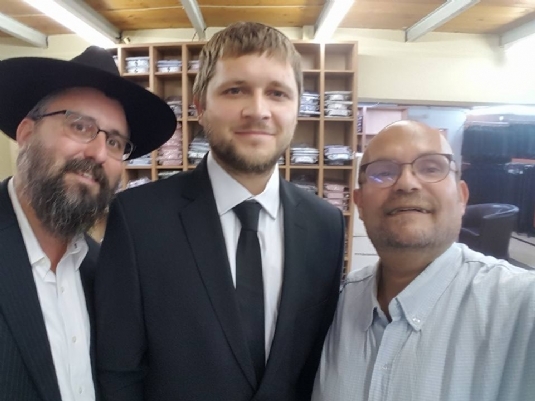 I was accompanied by the local Shaliach, Rabbi Yosef Dahan, and his son, Ron, who is the head of the Otniel Community Council. We began our time there speaking with some of the young people of Otniel. They feel devastated and horrified that their small community has had 11 people killed in terror attacks, some living on the same street as the Mark family. We offered them words of comfort and suggested some of the Rebbe’s ideas to them about gaining strength through good deeds done in memory of those who were murdered. Then we met Rabbi Miki Mark’s brother-in-law, the Rosh Yeshiva of the Otniel Yeshiva, who reminded us about the horrific terror attack that had taken place in his yeshiva in 2002 in which four young people were murdered. Then we walked into the Mark family home and sat down with them, our hearts aching for these beautiful children who had lost their father, whose mother and two siblings were wounded. 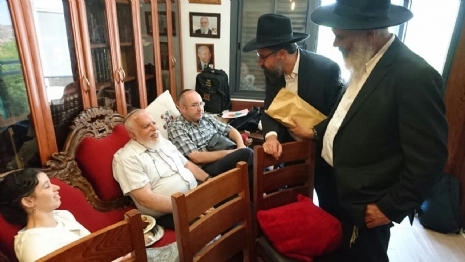 As we sat and talked together, they told us that their father’s family was related to the Rebbe and that Rabbi Mark had been studying the Rebbe’s teachings. We gave them a large check to help them through this terribly, terribly difficult time. 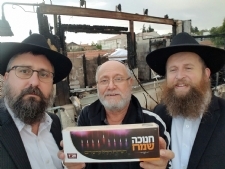 They were deeply grateful and told us how Rabbi Miki, as he is often referred to, would always give any amount of money he could to help others. Shlomi, Rabbi Mark’s oldest son, told us that he is married to a young woman whose family was also devastated by terror. The Mark family had embraced her family after the attack and ultimately he married her. Then we learned something chilling. 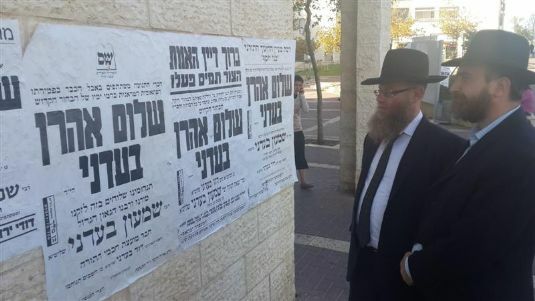 Rabbi Mark’s brother had gone to pay a shiva call to the family of 13-year-old Hallel Yaffe Ariel, who had been murdered in her sleep in Kiryat Arba. Hallel’s father, Amichai, was an old and dear friend of Rabbi Mark’s brother who came immediately after the funeral to be with him. When he was there, Amichai Ariel gave him a bottle of wine from his winery. Rabbi Mark’s brother said he was not knowledgeable about wines but would take it to his brother, Miki, for the following Shabbos, when they would be together, because he was very interested in and well-informed about wines and would appreciate it. His brother, Rabbi Miki, was murdered the next day and Amichai then came to pay a shiva call to Rabbi Miki’s brother. The two families are inextricably linked through the pain they have suffered. We pray that peace will come to Israel and the world very soon. Shabbat Shalom. 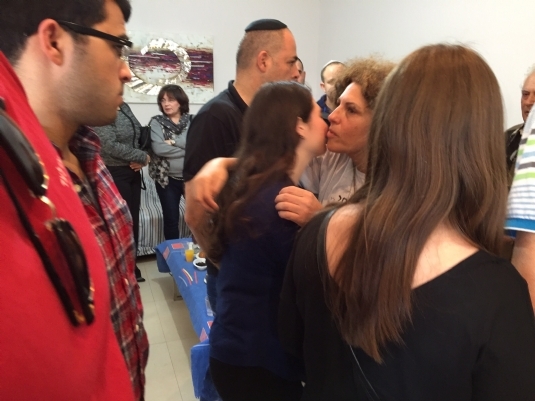 Today I visited the families of the kidnapped soldiers from the Gaza War. 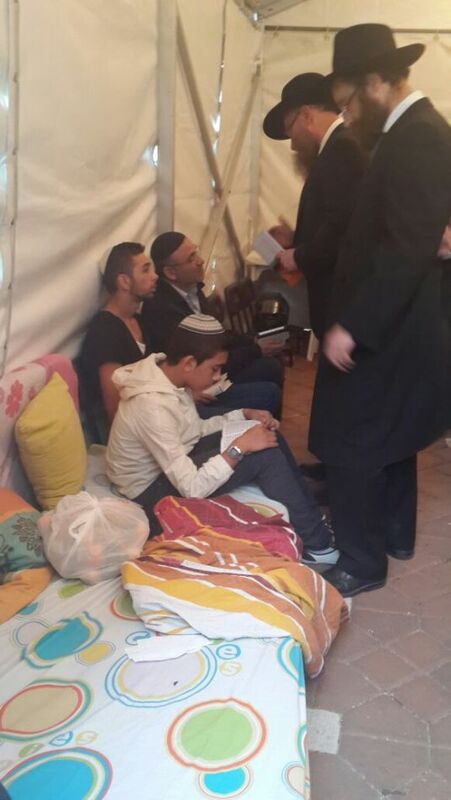 They were in a tent opposite the Prime Minister's House in Jerusalem. 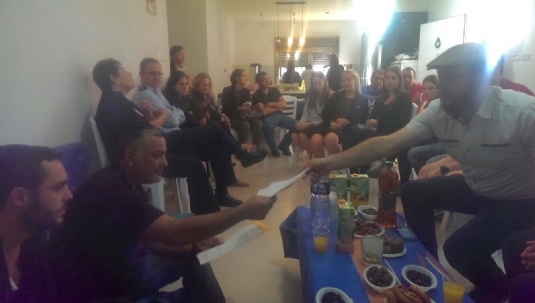 I spent time with the parents of kidnapped soldier Oron Shaul to express our solidarity with them and to pray for the release of their son and the release of Hadar Goldin. I comforted them with words of blessings and consolation from the Lubavitcher Rebbe. Oron’s brother took time out from planning future steps to help bring home his brother. He came over to me and asked to put on tefillin. 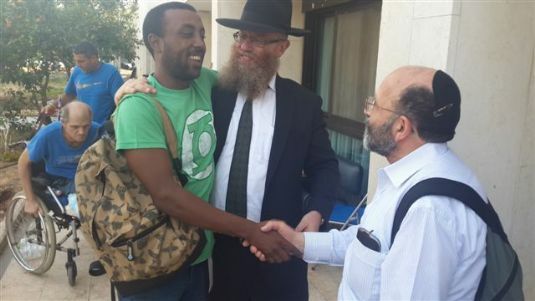 Afterwards, he told me that he is going to put on tefillin every day from now in the merit of bringing Oron home. His words touched me deeply. We pray for the release of kidnapped soldiers Oron Shaul and Hadar Goldin. Kiryat Arba resident Meir Pavlovsky, 31, was sitting quietly next to the Hazon David synagogue in his home town. 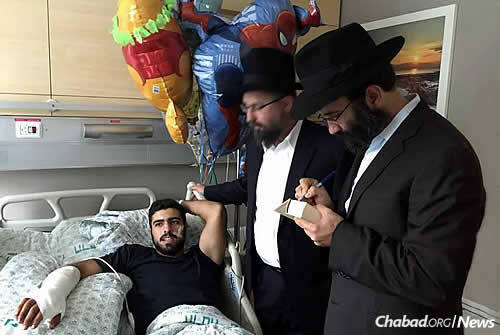 He was studying Torah when a terrorist appeared out of nowhere and brutally stabbed him in the stomach. 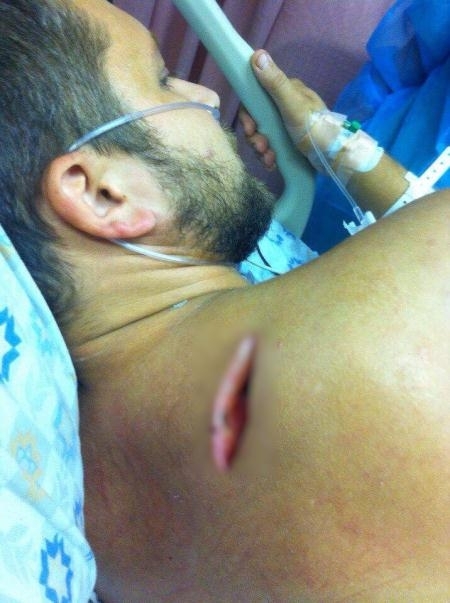 As the terrorist fled, he stabbed Meir in the back as well. Though severely wounded, Meir was able to get himself to a nearby IDF position and from there he was transferred to the hospital. 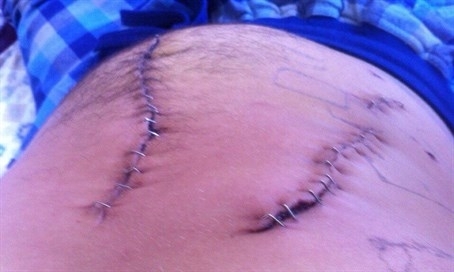 When he arrived, the doctors gave him a 10% chance of living, so brutal were the wounds that had been inflicted on him. The terrorist, who was just a teenager, fled toward Hebron and has not yet been apprehended. 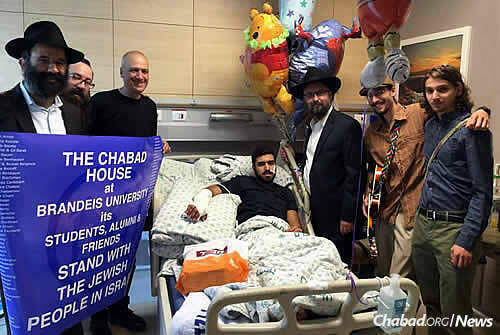 Chabad’s Terror Victims Project (CTVP) immediately went to the hospital to be with Meir. He is alone in Israel, his parents in Ukraine. 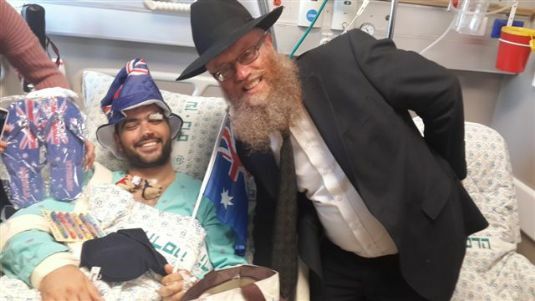 We became his family, visiting him numerous times during his ten-day stay in the hospital, including bringing him a young visitor from Vienna, Simon, who did not let the terror in Israel prevent him from coming there to celebrate his Bar Mitzvah. 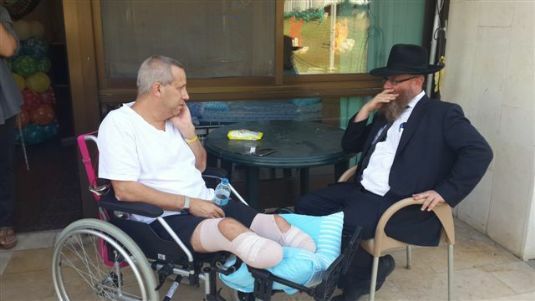 He spent much time visiting many victims of terror including Meir. 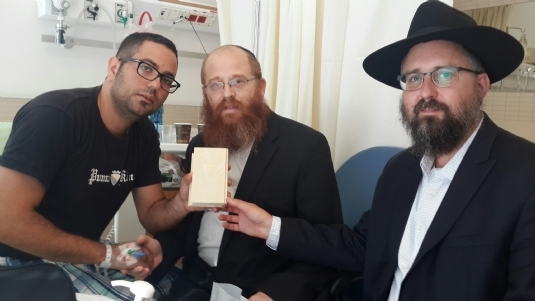 While hospitalized, we helped Meir put on tefillin and brought him numerous gifts – and we brought him continual comfort, support and hope as he struggled to recover from the wounds inflicted on him by a 10-inch long knife. 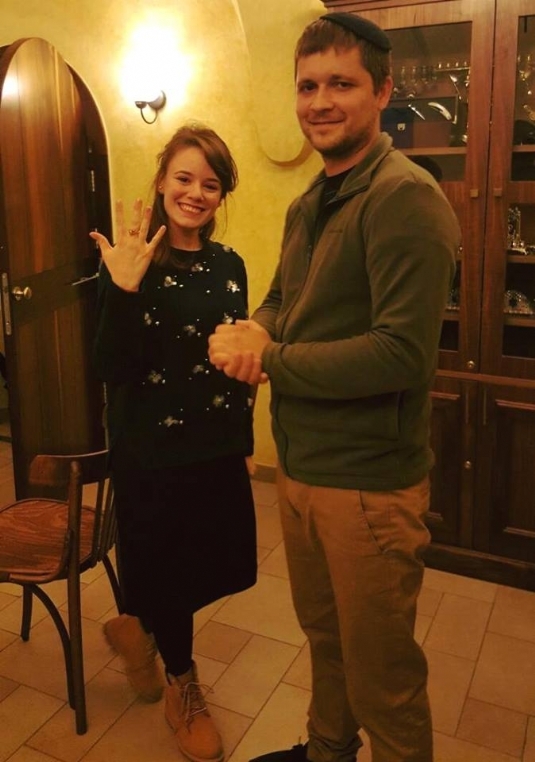 When the attack took place, Meir had been planning to become engaged, so as soon as he was released from the hospital, we took him to buy new clothes and provided help and support to him and his Kallah (fiancée) as they began to plan for their wedding. Meir also took time to visit the Rebbe’s room in 770 of Kfar Chabad to pray and offer thanks. This young couple is now well on their way to becoming married and CTVP will be there with them every step of the way on their journey. 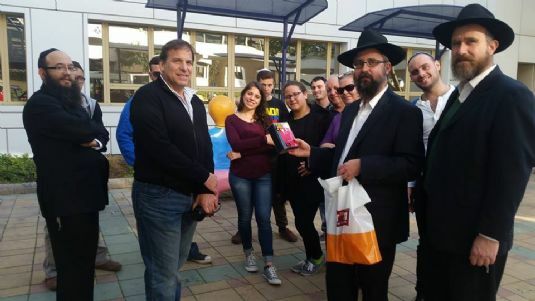 At Hadassah Ein Kerem Medical Center in Jerusalem are Rabbi Peretz Chein, left, executive director of the Chabad House at Brandeis University in Waltham, Mass., who came with a local delegation to visit Israeli terror victims and their families. 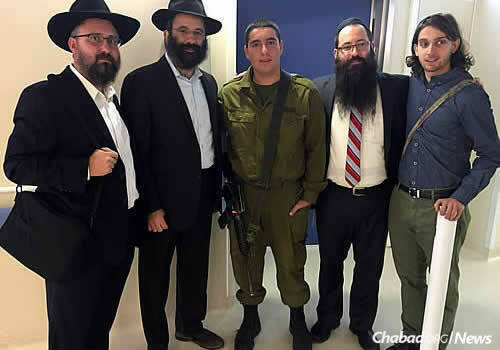 To his right are Rabbi Menachem Kutner, director of the Chabad Terror Victims Project; Rabbi Yisroel Naftalin, the hospital's Chabad emissary; and Brandeis student Tzvi Miller, far right, with his brother, Netzach, who lives in Israel. Israel is once again the hotbed of terrorist attacks, and it’s become an uneasy time for some people to visit the Holy Land. 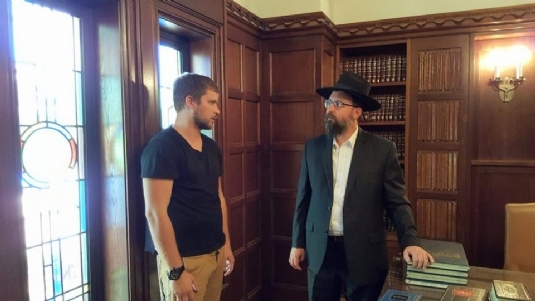 But for Rabbi Sholom Raichik, director of Chabad of Upper Montgomery County in Gaithersburg, Md., and Rabbi Peretz Chein, executive director of the Chabad House at Brandeis University in Waltham, Mass., now is the right time. Working with representatives of the Chabad Terror Victims Project, both brought delegations from abroad to comfort victims of terror and demonstrate solidarity with the Israeli people. 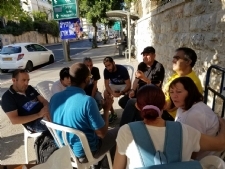 Raichik’s delegation spent 36 hours in Israel. 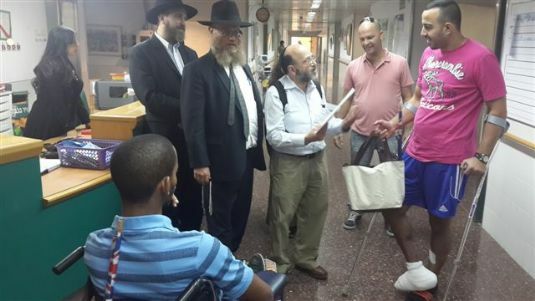 The group came straight from the airport outside of Tel Aviv to Soroka Medical Center in Be’er Sheva to visit those who had been wounded in the Oct. 18 attack at the central bus station there, in which a 19-year-old Israeli Defense Forces soldier, Cpl. Omri Levi of Sdei Hemed, was shot and killed. According to victims and their families, the visits brought hope and encouragement to their profoundly changed lives. Chein, right, writes messages of love and hope in the Chitat book (Chumash, Tehillim and Tanya) given to a wounded soldier. His hand was severely injured, prohibiting his return to serve his country. Also accompanied by CTVP, Rabbi Chein brought a delegation from Brandeis University, with students on campus volunteering to publicize the trip and raise money for it. The group carried with them a school banner that also listed the names of students at Brandeis who stand in solidarity with Israel. 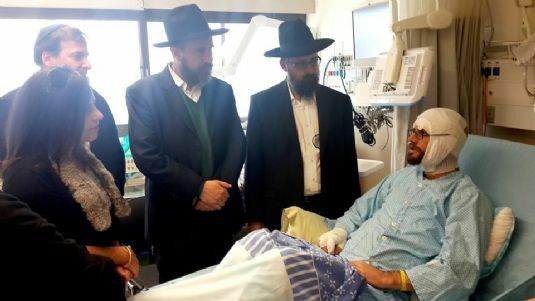 On their second day there, they went to Hadassah Ein Kerem Medical Center in Jerusalem to spend time in the hospital with attack victims and their families. The recovering ranged from an elderly man who had been stabbed near his brain and an Israeli soldier who was wounded by a terrorist to a family whose son lay in a coma and an elderly woman whose husband of many decades had been shot and stabbed; he, too, was in a coma. Each stop along their way—as they sat and listened to harrowing story after story—they made it a point to sing inspiring songs, lifting spirits as best they could. 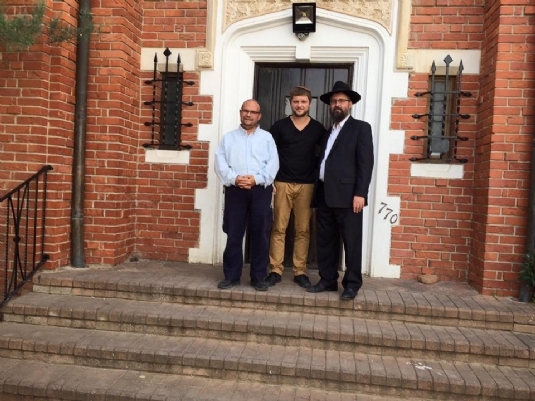 Rabbis Kutner, Chein and Naftalin, along with Brandeis student Miller, stand outside the room where a terrorist is currently being treated, just a few rooms away from where the people he attempted to murder are being cared for. Pictured with them is the soldier guarding the room. 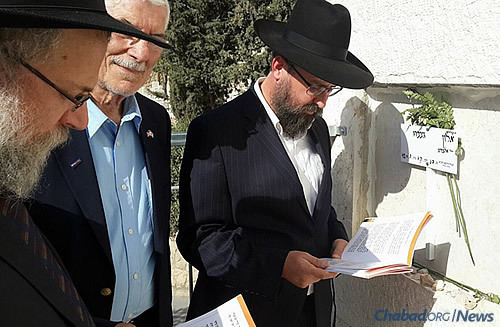 In addition to prayers for the wounded, there were also calls by rabbinic leaders around the world for increases in Torah study, prayer and other mitzvahs, in addition to donning tefillin. For suggestions of what Jewish people around the world can do to help their brethren in Israel, read the article 7 Things You Can Do for Israel Today here. 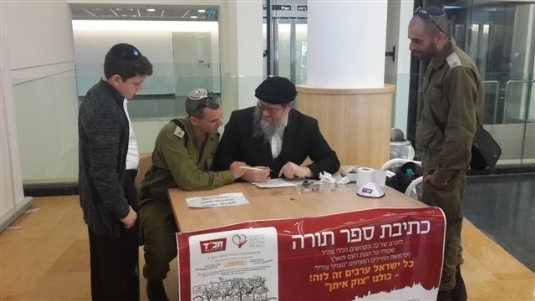 The tefillin campaign comes in light of instructions given by the Rebbe, RabbiMenachem M. Schneerson, of righteous memory, who had issued a similar call during other dangerous times in Israel. Before the outbreak of the June 1967 war, for example, the Rebbe prompted an active campaign for Jewish males over the age of 13 to perform the mitzvah of tefillin. Wrapping tefillin is part of the Rebbe’s 10 mitzvah campaigns introduced between the years of 1967 and 1976, which formed the platform upon which the Rebbe’s far-reaching program to revitalize Jewish life and observance throughout the world was built. 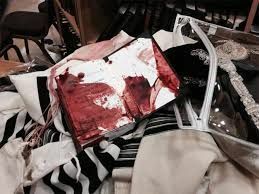 The laying of tefillin instills fear in the enemy, explain the sages of the Talmud, quoting: “Then all the peoples of the earth will see that the name of the Lord is called upon you, and they will fear you.” (Deuteronomy 28:10). Chein, Kutner and Miller, along with Rabbi Ahronchik Prus, right, of the Chabad Youth Organization, visit soldiers guarding the Armon Hanatziv neighborhood of Jerusalem, where several terrorist attacks have taken place over the course of the month. As attacks continued, the Chabad Terror Victims Project (ctvp.org) released an updated list of those injured in recent terrorist attacks. The public is asked to continue their prayers for their speedy and complete recovery. It is customary for petitions for recovery to be recited in synagogue on the Sabbath and on other days when the Torah is read in public. Here is a list as of Friday, Oct. 23. Names will be added and deleted as they become available. To assist wounded Israelis and the work of CTVP, which provides financial, emotional and practical support to those suffering from terror, see:http://www.ctvp.org/templates/articlecco_cdo/aid/1126571/jewish/Donate.htm. 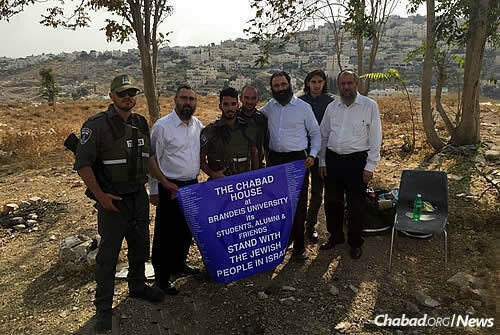 For more news, opinion, inspiration, advice and first-person articles on the October 2015 Wave of Terror in Israel, visit the special Chabad.org section here. 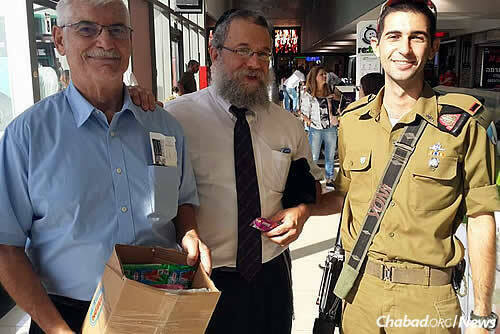 Rabbi Sholom Raichik, right, director of Chabad of Upper Montgomery County in Gaithersburg, Md.,and community member Bernard Schack bring gifts for Israeli soldiers in Be’er Sheva, where a deadly attack occurred last week at the central bus station. 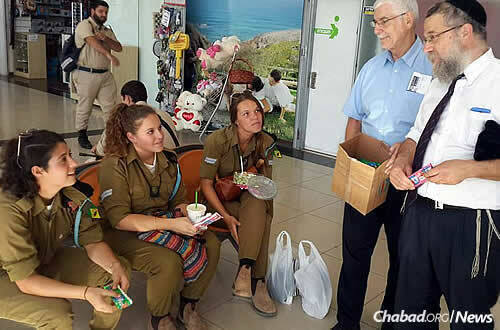 Raichik and Schack also deliver tefillin to male soldiers. The Raichik group at the grave of Alon Govberg, who was killed in a bus attack one week ago and has no family in Israel. The men organized a minyan at his grave site to say Tehillim and Kaddish, making the end of the shiva (mourning) period. 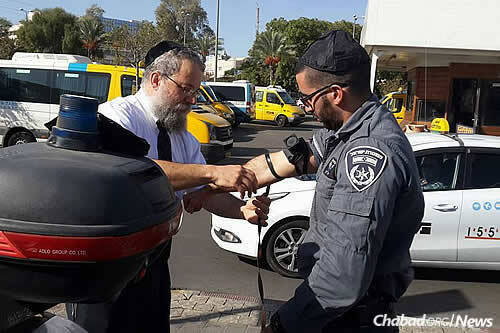 Raichik helps a border policeman in Be’er Sheva don tefillin. Saying prayers for the injured, as Jewish people everywhere can do to help. Yair, who lives in Raanana in Israel, was getting ready to leave the house a few days ago. He was getting dressed and looking for a pair of tzitzit (ritual fringes) that he wears under his shirt all the time, following Jewish commandments. It turns out they were all in the laundry except the brand new pair he had purchased in honor of his sister’s wedding which was to take place in two days. As he intended to keep them clean and new for the wedding, he decided he would go without wearing tzitzit that day. But, at the last minute, uneasy about his decision, he turned back and put them on, knowing it was the correct thing to do – and feeling that if he didn’t, he would somehow be inviting trouble. He left for the bus stop and was waiting for the bus to arrive. He was feeling tense already because of the terrible terror attacks that had been taking place all across Israel. Out of the corner of his eye, he noticed a man near him who was having a conversation in Arabic on his phone. The man looked very agitated and was dripping with sweat. Before Yair could do anything, the man suddenly lunged at him and began stabbing him in the shoulder and neck. As Yair struggled with him, despite the pain and horror, he tried to make sure to keep the attacker away from a woman and her children nearby. 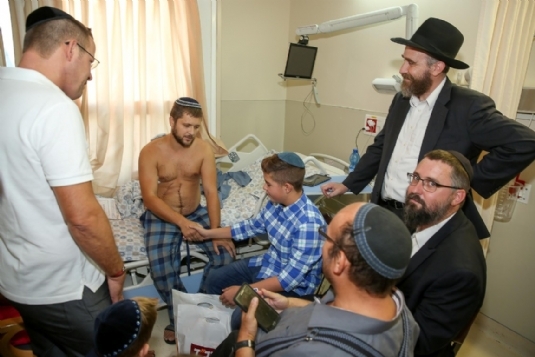 People around him came to his rescue, some tackling and holding the terrorist, the others taking his tzitzit and tearing them into bandages to staunch the flow of blood. 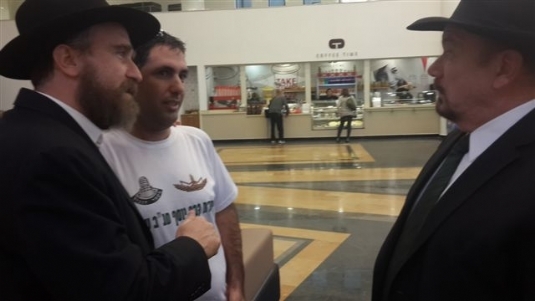 Yair was rushed to Meir Medical Center in Kfar Saba where Rabbi Menachem Kutner, Director of Chabad’s Terror Victims Project (CTVP) and Rabbi Yossi Lipkin met him. 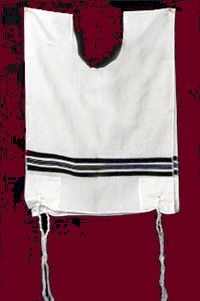 Yair told them that he felt sure that Hashem had protected him from worse injuries in the merit of his having worn his tzitzit that morning. Not to mention the fact that the tzitzit stopped his loss of blood. Yair underwent a series of treatments and was released from the hospital just in time to attend his sister’s wedding! Mazel Tov to all!! 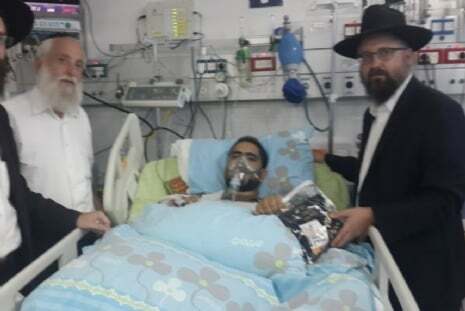 Chabad's Terror Victims Project have been encouraging and assisting those who were injured in the recent terror attacks in Jerusalem. CTVP staff and volunteers are visiting the wounded in the hospitals Jerusalem in order to cheer them up and to provide them with emergency aid. 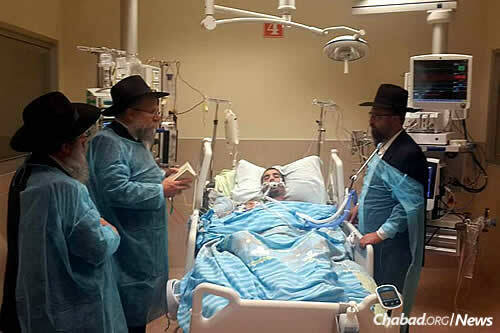 An especially heart moving visit took place at the bedside of the baby who was injured by a gun shot to the leg and whose father was murdered by the terrorist R”L. 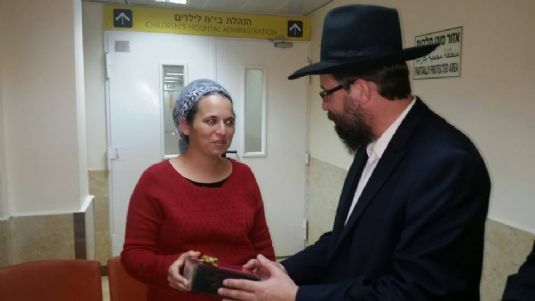 Rabbi Menachem Kutner saw that the baby is there alone with only his aunt by his bedside. He immediately returned again with his hands full of toys and games to make it easier for the baby and the healing process. Please take a moment to recite a Psalm for the speedy recovery of those who have been wounded. In the lobby of the Rehabilitation Department at Tel Hashomer Hospital in Ramat Gan, Israel, a very moving and special event has taken just place. 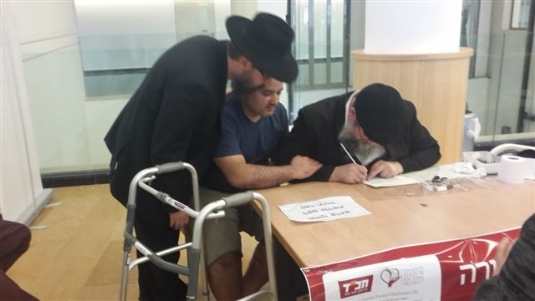 Chabad's Terror Victims Project (CTVP.ORG) organized the writing of a special Torah Scroll in the merit of the healing of all the soldiers wounded in Operation Protective Edge, also known as the Gaza War, which took place in the summer of 2014. Dozens of soldiers who were severely wounded in the fighting in Gaza remain in hospitals and rehabilitation facilities seven months after the conclusion of the war, battling severe injuries. From the beginning, CTVP has been with these soldiers, at their bedsides, bringing comfort, hope, and practical assistance. As well, CTVP has been with their families enabling them to be with their loved ones as much as possible by providing babysitting, hot meals, grocery shopping and anything that they have needed during this difficult time. 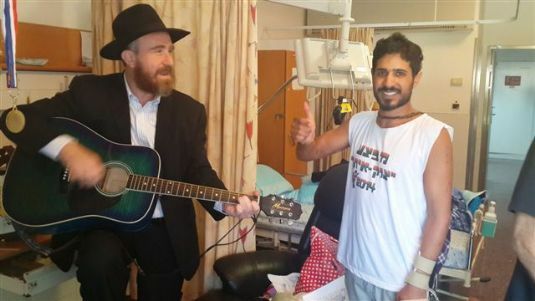 Rabbi Menachem Kutner, Director of CTVP, and Rabbi Yossi Swerdlov, Associate Director of CTVP, came to the hospital to host this very special event. All of the wounded soldiers were invited to personally write a letter in the Torah Scroll to help in their healing, and the healing of all their comrades who are still suffering from debilitating injuries. Rabbi Levi Gopin, Shaliach to Tel Hashomer, also invited the medical staff and department heads to write a letter in the Torah Scroll. The Torah is a gift of the Ganz family of Toronto who are part of the Chabad community under the leadership of Rabbi Mendel Kaplan. The family participated in this exciting and moving event along with a family friend, Rabbi Menachem Mendel Gluckowsky, Deputy Secretary of Chabad Rabbis. All of the wounded soldiers offered their deepest gratitude to the Ganz family and to CTVP for the sacred opportunity to write their own letter in the Torah Scroll -- a merit that will strengthen and encourage them in their often painful journey to move forward in their healing and to complete their rehabilitation. Deepest appreciation goes to the Ganz family from CTVP for this wonderful mitzvah and the hope and help it is providing to these true heroes of Israel and the Jewish People. 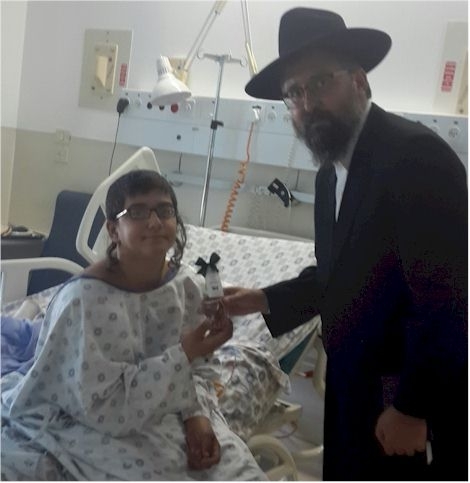 A group from Chabad's Terror Victims Project has just been to the hospital where 11-year-old Ayala Shapiro remains in critical condition. 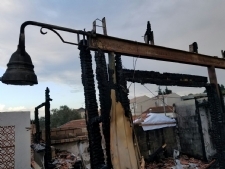 On Thursday, December 24, Ayala and her father, who was also injured, were on their way to their home, which is near Ma’ale Adumim in Samaria, when terrorists hurled a firebomb at their car. They managed to escape the flaming car but both were burned, Ayala very severely. They were treated on the scene and taken to the Tel Hashomer burn unit where Ayala was put on a respirator. We met with Ayala’s father and mother in the hospital. Together we said special verses of Tehillim on behalf of both father and daughter. We were joined by 2 families from Miami who came with us and gave gifts to Ayala’s family. 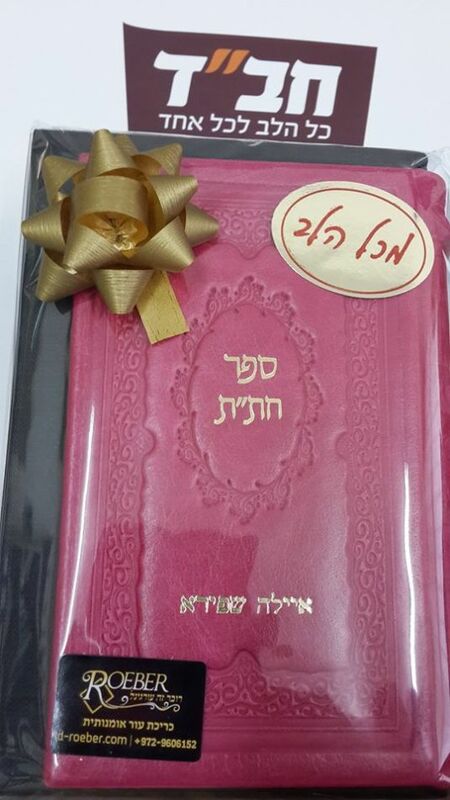 CTVP gave Ayala a beautiful pink leather volume of Chitas with her name stamped in gold from the Rober book binders. Ayala’s parents were very moved by the visit from CTVP and the families from Miami. They thanked everyone for their solidarity and for bringing them strength, compassion, and support. An emotional request was made by Ayala’s parents that we ask everyone to please continue their prayers for the full recovery of Ayala bat Ruth. 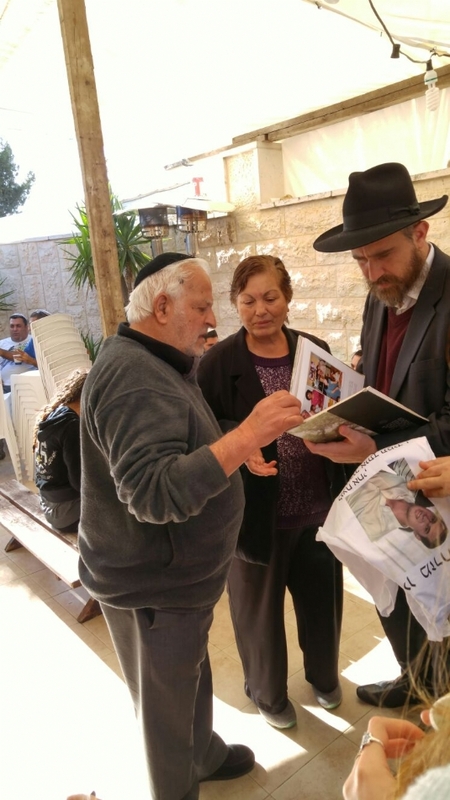 CTVP representatives recently visited the home of Zidan Saif, of blessed memory. He was the Druze police officer who was killed in the horrific terror attack in Har Nof a short while ago. Zidan was trying to protect the lives of the Jews praying inside the synagogue. His great, heroic sacrifice saved many lives that might have been lost without his courage and dedication. 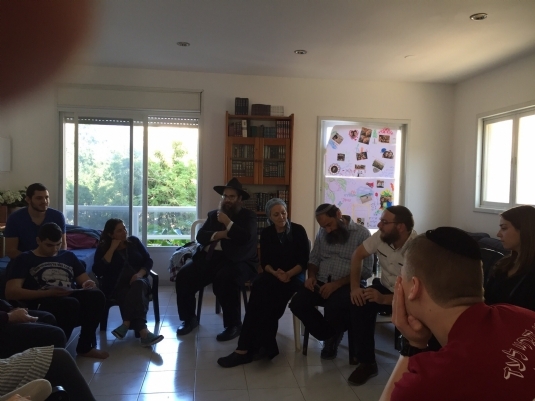 Rabbi Menachem Kutner, CTVP Director, and Rabbi Ahron Prus went to the home of Rinal Saif, Zidan's widow, and their 5-month-old baby. They live in the Druze village of Yanuach in the Galil. 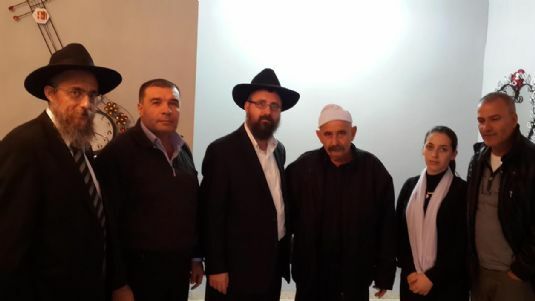 Out of respect to the Rabbis, they were met and greeted there by the head of the local council in Yanuach along with other respected members of the community. It was an extremely moving and emotional visit. Rabbi Kutner presented a financial gift to Rinal from two anonymous CTVP donors in America. He told her how much the brave actions of her husband were appreciated and that they brought condolences on behalf of all those whose lives had been saved because of him. The young widow was deeply grateful as she struggled to maintain her composure. She asked us to convey her deep gratitude to the donors. She was also very grateful that her husband’s heroism was recognized and acknowledged not only in Israel but internationally as well. Many people throughout the Druze community heard about the visit and were so very appreciative on behalf of Rinal and the baby. Several years ago, a Druze police officer from the same village was killed in the line of fire. The same donors sent a gift for his family at that time. When his brother heard that representatives of CTVP were in their village, he came to say hello and reiterate his great gratitude for the help CTVP provided to his brother’s family. As Israel continues to struggle with violent terror attacks including a stabbing today, CTVP’s work is taking us across the country to the families of the victims. 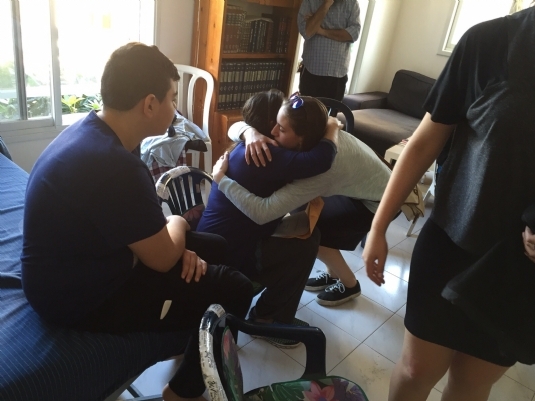 Your generous help at this difficult time will bring comfort, help and hope to Israeli families whose lives have been shattered by terror and war. Yitzchak is the oldest son in a family of nine children. 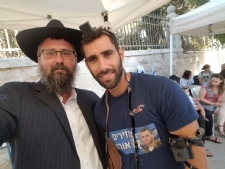 His father was one of the four Rabbis brutally murdered in the Har Nof area of Jerusalem in November. During my first two visits to the family, Yitzchak sat quietly, clutching his father’s tefillin to his chest. When I came again, this time with CTVP supporters who flew in especially from the U.S., Yitzchak took the tefillin out of their cases. He wanted to show us the blood splattered on them – his father’s blood. The straps too had been drenched in blood and were buried. I struggled to maintain my composure as Yitzchak spoke to us in a soft voice, his eyes filled with tears. A child should never have to go through this. We’re doing everything we can for these families. 24 children have been robbed of their fathers. Four women robbed of their husbands. We’ve given each of these families a large financial gift from CTVP donors in the United States. For those wounded in this horrific attack we’re providing support as well. One is a father of ten children who’s fighting for his life. Babysitting has been arranged for the children, and we are providing a hotel so his wife can be at his bedside in the hospital 24/7. 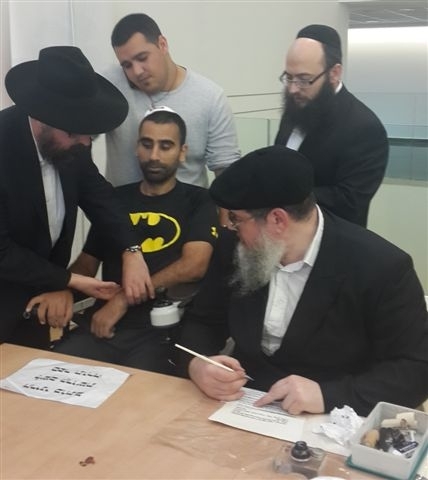 We’ve also given financial help to the family of the courageous Druze police officer who gave his life, thus saving many lives in the synagogue. We’ve visited his family and will do all we can for them. Jerusalem has had far too many terror attacks in recent weeks, and we are helping the families whose lives were shattered by those incomprehensible acts of violence. Tragically the terror continues. We urgently need your help now to be “everywhere” at once during this terrible period of violence plaguing Israel. In addition, there are the thousands of families already in our care from previous wars and terror attacks, as well as the recent Gaza War. May we speedily see the time when Hashem will wipe away the tears and send us Moshiach now.